We have the perfect gnome to guard your garden and your home! 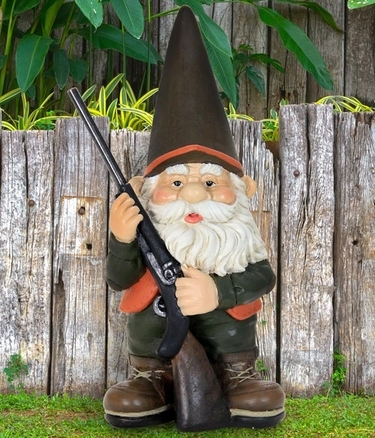 Meet Hunting Gnome, proud and determined with his rifle in-hand. Together, you will both be prepared for anything! He's constructed from weather-resistant cast stone resin, so he's durable and tough, inside and out. And our Hunting Gnome is the perfect gift for hunting enthusiasts, gnome collectors, and garden lovers alike. He may even help defend your garden from those pesky critters, keeping you and your garden safe and sound! Size: 7" x 6" x 13" H, Resin.